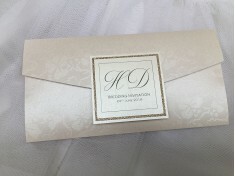 The price displayed is the cost per invitation. 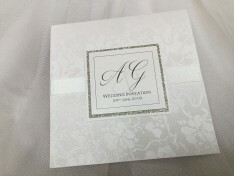 A maximum of three sample invitations per customer can be ordered. 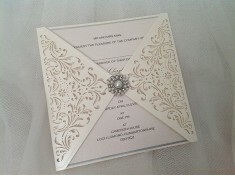 A beautiful wedding invitation complete with RSVP. 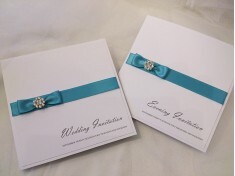 Various ribbon colours available. 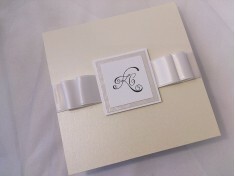 ..
A beautiful wallet pocketfold invitation with your own initials printed on front. 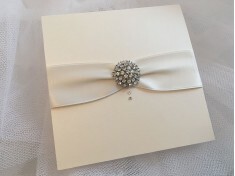 Comes in white ..
An elegant pocketfold made from gorgeous white pearl card card with white chunky glitter and diamant..
A simply stunning pearlescent pocketfold with handcrafted bow and diamante detail. 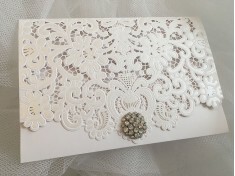 Inside, the weddi..
An intricate laser cut wallet complete with 2 inserts - one for the main wording and an RSVP for you..
Intriquite laser cut design with diamante cluster embellishment. 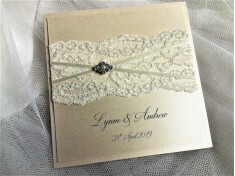 All inserts are printed on t..
One of our most luxurious designs made from the finest card - A perfect introduction to your wedding..
A pocketfold invitation personalised with the Bride and Groom’s names, featuring a sparkling diamant..
A gorgeous wallet pocketfold invitation made from luxurious tapestry card. 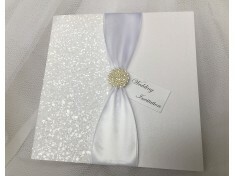 Comes in white or Ivory&n..
A gorgeous pearl pocketfold invitation with luxurious double sided satin ribbon, white glitter mater.. 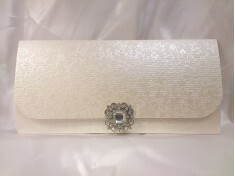 Stunning white Pealescent pocketfold with a large pearl and diamante charm perched on luxurious.. 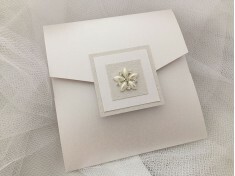 Introducing a gorgeous pocketfold invitation which is made from a beautiful pearl card and..
A stunning white glitter design made from an ice white pearl pocketfold. 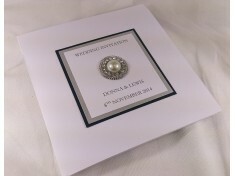 Feels thick and luxuriou..
A stroking pocketfold invitation made from the finest pearl embossed card. 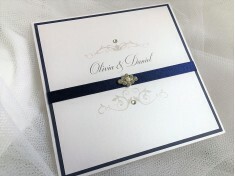 Personalised with yo.. 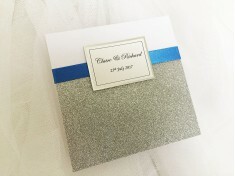 Stunning pocketfold with silver glitter border and sparkling charm ..
A vintage themed flat style invitation made from the finest card. 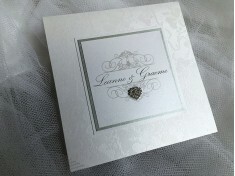 The wedding details are print..
A beautful personalised pocketfold invitation made from luxurious embossed card. 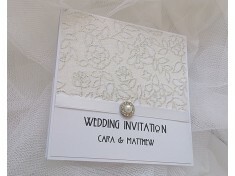 Includes RSVP card ..
One of our gorgeous new designs features this delicate laser cut invite with pearl and diamante char.. 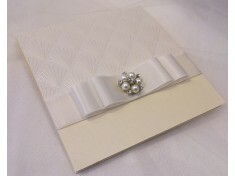 Premium white embossed pocketfold with pearl heart perched on top of luxury satin ribbon. 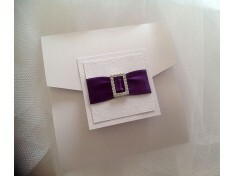 Inside, th..
One of our show stopping designs! 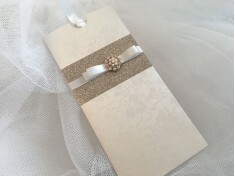 Available in various ribbon and glitter card colours. 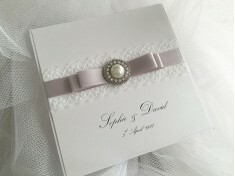 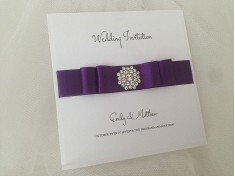 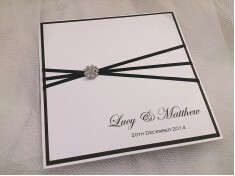 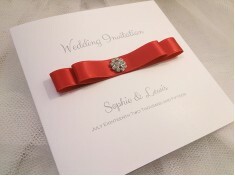 ..
A beautiful simple yet classic design with luxurious satin ribbon and personalised names. 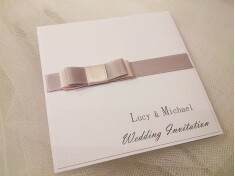 ..
A stunning pocketfold invitation made with thick luxurious double sided satin ribbon with a large sp..
Beautiful embossed wallet with insert for the wedding details, information and RSVP and envelope. 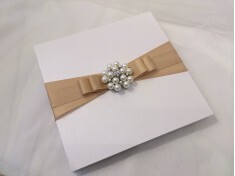 ..
Shimmeringpocketfold card with pearl charm. 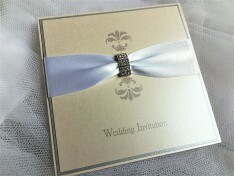 Inside your wedding details are surrounded by matching c..
A striking design complemented with Grade A crystal charm. 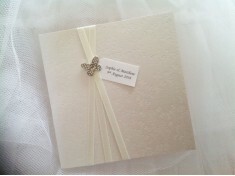 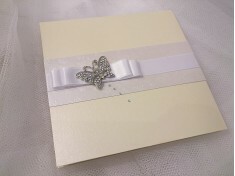 Inside this pocketfold, the invitati..
A beautiful butterfly wedding invitation with crystal butterfly charm perched upon ivory satin ribbo.. 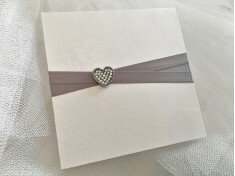 The Forever Heart range is a pocketfold card made from thick luxurious glitter card laid beneath a l..
A new design for 2016 - The silver lace is a pocketfold invitation. 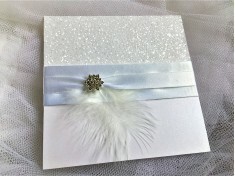 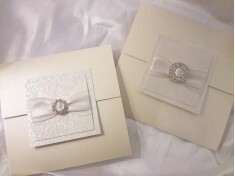 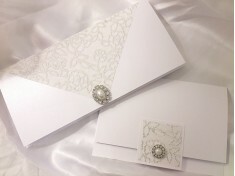 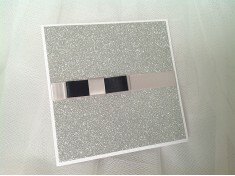 RSVP and envelope included ..
A gorgeous pearl white pocketfold with embossed card and diamante buckle. 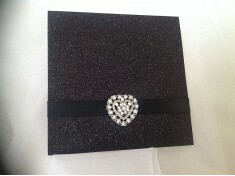 It fastens with a velcro d.. 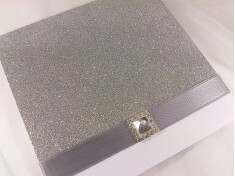 The ultimate in luxury! 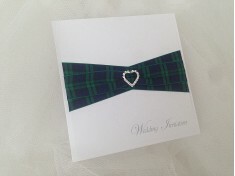 The Caspia features a large pearl and diamante charm on top of double sided ..
Rennie MacIntosh styled pocketfold with pearl and diamante charm perched on luxurious satin ribbon w..
A striking square pocketfold with the Bride and Groom’s names and wedding date surrounding a dazzlin..
A beautiful diamante heart sits on 3 layers of tartan ribbon. 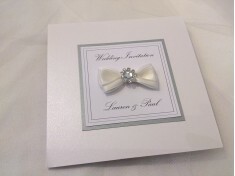 Inside this pocketfold booklet, t..
A simply stunning introduction to your wedding day, giving your guests the ‘wow’ factor. 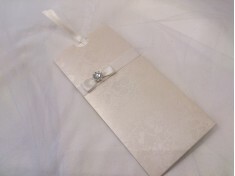 A handba..
An Ivory pearlescent pocketfold featuring a sparkling diamante butterfly on top of luxurious double ..
A beautiful glittering pocketfold with handmade bow. 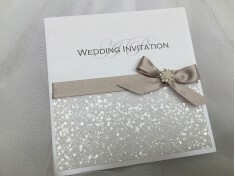 Available in silver, gold and white glitter car..
A beautiful sparkling charm is set upon a handcrafted bow in a pocketfold invitation. 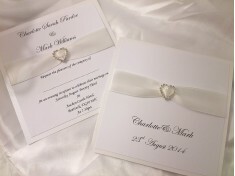 The names of t..
Gorgeous handbag style invitation made from embossed ivory card and complemented with a large diaman..
Personalised pocketfold card with diamante heart and thick luxurious double sided satin ribbon. 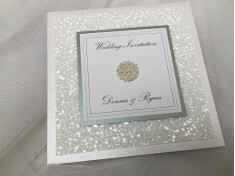 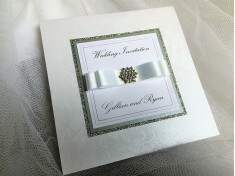 R..
Shimmering Ivory card with a double diamante buckle set in place with double sided satin ribbon and ..
A wallet style invitation made from ivory embossed card. 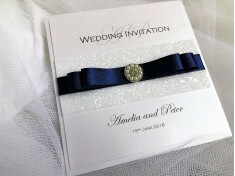 A delicate handcrafted bow is perched upon ..
Sparkling glitter card with luxurious blue satin ribbon showcasing the Bride and Grooms name an.. 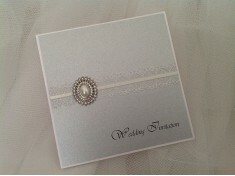 Premium italian pearl card with grade A sparking charm and your choice of ribbon colour. 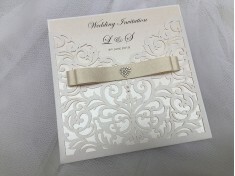 The wedd..
A pearlescent ivory pocketfold with a layer of embossed shimmering paper finished with a thick satin..
A shimmering pearlescent pocketfold with the Bride and Groom’s initials surrounded by thick satin ri..
A luxurious embossed wallet surrounded by thick double sided satin ribbon and finished with a single..
A striking invitation with thick satin ribbon showcasing a square diamante embellishment. 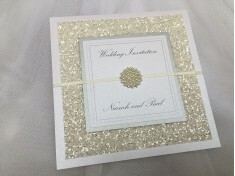 This de..
A sparkling introduction to your wedding day! 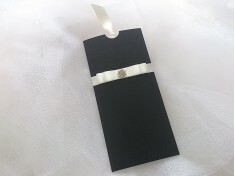 The Verbena pocketfold is made from an ice white po..
A simple yet eye catching design with beautiful satin ribbon with a sparkling charm. 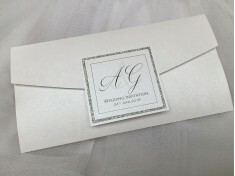 The Bride and G..